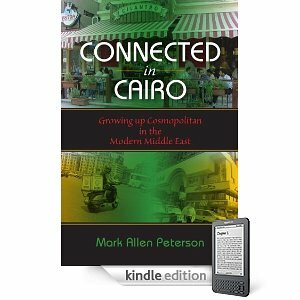 I just learned that Amazon has released a Kindle edition of Connected in Cairo. The best thing about this is the price. The digital edition listed price is $20.95 but right now Amazon is offering it for only $9.99. My daughters bought me a Kindle last Christmas and I must admit that I don’t use it as much as I should–I really like the portability, and the screen clarity, and I like that it can read to me–in a monotone robotic voice–while I’m driving or making dinner or some other task that occupies my hands but not all of my mind. For my professional reading, though, I like books. I underline passages, make notations, indicate links to ideas in other books and the Kindle notation system, although many of my students love it, just doesn’t let me make the hand-to-brain connection that physical marginalia writing does. This is one professional book I plan to get in a Kindle edition, however (and no, I don’t get it for free. That’s not how it works, alas).